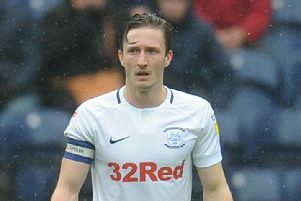 It proved to be the late, late show at Deepdale as PNE collected another three points in the race for a play-off place, this time against Birmingham City. It was one of those games that looked to have 0-0 written all over it until a 94th-minute corner found Sean Maguire unmarked in the box and the Irishman made no mistake sending the home fans into absolute ecstasy with the winning goal. It is a long time since I have heard a roar at Deepdale as loud as the one that accompanied the goal celebrations, and although it was not a particularly good performance by the boys we once again proved that we never give up. Just how important this win will be remains to be seen. The manager made three changes from the starting line up at Middlebrough in midweek with Darnell Fisher, Brad Potts and Jayden Stockley coming in to replace Josh Earl, Alan Browne and Paul Gallagher. The visitors started the better and Preston had to defend for a while on a wet, miserable Deepdale afternoon. Declan Rudd, the villain at St Andrews, made an excellent save one on one early in the game. PNE then got into the game later in the first half and at least started to threaten up at the Kop End. Stockley probably had our best chance of the half when he spun on a shot but his effort was weak and the sides went in level after mediocre first half. The second half was a bit more even but once again it was the Blues who started the better and looked the more likely to break the deadlock. Robinson appeared on the hour mark to a huge reception from the home faithful and tried to get into the action as quickly as possible. He obviously needed the time on the pitch and looked a little rusty at first but certainly had more influence on the game as the match wore on. The rain was coming down harder and the temperature was dropping as North End forced one final attack in the four minutes added on by Mr Duncan. A shot was blocked and North End won a corner on the right hand side. Daniel Johnson swung a perfect corner in, right on to the head of Maguire who lit up Deepdale with the winning goal. Possibly a slightly fortunate win for North End on the day but these things even themselves out over the season and we will take our luck as it comes like any other team. Preston worked hard on a windy day and a wet pitch but missed Gallaher and Browne in the engine room. I’m not one for generally criticising referees but I thought Mr Duncan was too inconsistent in his decision-making and this led to frustration on both sides. The manager commented on the fact that there were less than 12,000 home fans in with the boys on a great run and this really is something the club need to look at. Nine points from nine this week is a dream of a return in three games where we haven’t particularly been at our best. However the fight and tenacity of the boys may well take to a place we could never have dreamed of back in early October. It really is ‘game on’ now.